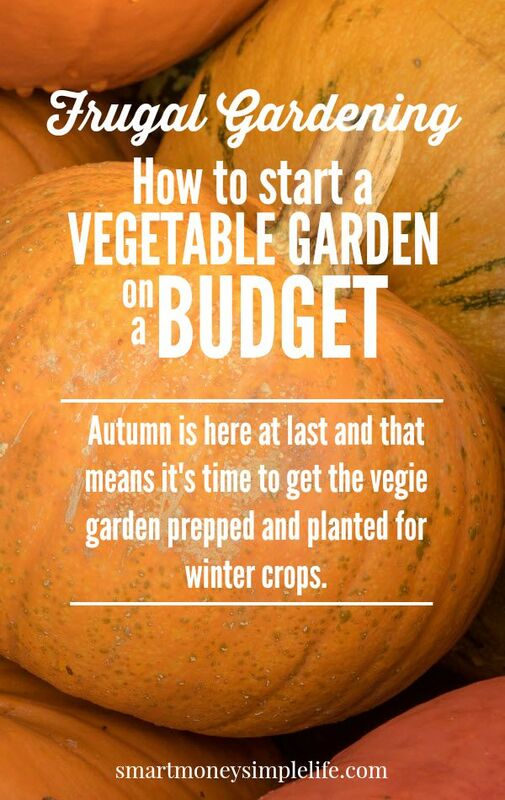 Autumn is here at last and that means it’s time to get the vegie garden prepped and planted for winter crops. I used to run my vegie garden all year (I live in a temperate zone) but for the last few years, I’ve chosen not to plant out during the summer. My reasons are two-fold: excessive heat; and lack of water. Thankfully, this summer we didn’t see too many seriously hot (40+ C / 104+ F) days and the average rainfall was statistically near the average but… the nature of that rainfall changed. When it rained, it was torrential. To the point where my gutters backed up on three separate occasions and I had water coming through the ceiling and down the walls. Thank goodness for pine lining boards! If I’d had plasterboard on my walls and ceiling it would have been a disaster. I’m seriously considering extra down pipes off the roof before next summer. But, back to the garden, given the heavy downpours didn’t get a chance to soak into the soil, everything in the garden looked thirsty again within a day. Frugal gardening is nearly impossible if you have to buy water. So, until my rainwater tanks are sorted out, I’ll be skipping the summer garden. The most important skill in frugal gardening is, of course, resourcefulness. Anyone (well, mostly) can create an impressive kitchen garden by throwing copious amounts of cash in its direction but, if your aim is frugal gardening you’ll need to develop your resourcefulness along with your green thumb. Don’t buy new materials to edge your garden, look around and see what you’ve already got. Remember, too, you don’t need to edge your garden, you can just keep it neat with a sharp spade. The single most important thing to consider when creating your vegetable garden is its position. It needs to be bathed in full sun for about eight hours. Any less than that and you’ll probably be disappointed with the results. Save yourself time and money by getting the position right first time. Do you have family, friends or neighbours who are gardeners? Not only will they be a source of considerable knowledge and experience, they might also have seeds (saved from previous crops), seedlings (that they’ve grown from saved seed) or plants that they’ve propagated that they’re happy to give you. You’ll find gardeners are a very generous bunch and will happily share with and guide budding gardeners. There’s a simple truth about growing food that is often overlooked: if the nutrients are not in the soil, they wont be in the food. This means, caring for and feeding your soil is a vital step to a thriving and healthy garden. The most frugal way to improve your soil is make your own compost. This is easily done using kitchen and garden scraps. There is a science to it, but in the beginning the focus is on getting started not perfecting it. Check out How to Build a Compost Heap for a step by step guide. Also, the richer your soil the better your plants are at resisting pests so you wont need to worry about the pests getting your produce before you do. Gardening usually requires added water, unless (from what I hear) you live in Seattle. Frugal gardening requires free water. Depending on where you live, mains water can be expensive enough to negate any monetary benefit you get from your vegetable garden. So, you need to find a way to frugally harvest rainwater. There are plenty of ways to do this, from large tanks to rain barrels. Hopefully, my tank will be back in action before next spring – I just need to build a new base for it (a project that scares me a bit). There’s no point in wasting space and resources on vegetables you don’t already eat. 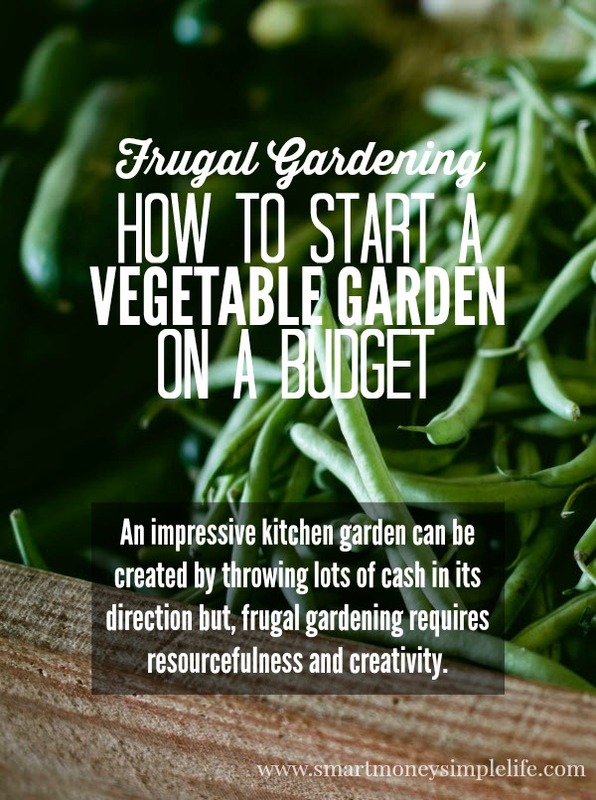 Frugal gardening is about adding value to your budget not spending time and money on vegetables you might not like. You can get creative later. At the start, just grow the basics that you know you’ll eat. Your list will be specific to you and your family. Most people look at me funny when I say cauliflower is my favourite vegetable! Don’t worry about growing too much of a good thing, you can always preserve it or share the produce with friends and family. Your standard weed killers are not only highly toxic, they’re also expensive. Frugal gardening, as I mentioned earlier, requires resourcefulness. There are a number of different ways to handle weeds and some methods are more appropriate than others. Here are some great suggestions from Good Housekeeping. Gardening is not an exact science. A garden’s health and productivity are in constant flux so it’s important not to set your expectations too high. Some seasons you’ll grow more green beans than you know what to do with and the next you’ll struggle to get enough for a couple of meals. As long as you’re feeding your soil, planting strong seedlings, rotating your crops (I’ll chat about this soon) and providing water when needed, you ought to reap much, much more than you sow. Will you be planting a vegetable garden this season? Do you have any frugal tips for beginners? We had our first garden last year. It went pretty well, but I am going to grow fewer items this year. I got a little over zealous and tried to grow too much variety. Yes, it’s easy to lose control of a vegie garden. Before you know it, it’s like Day of the Triffids out there! Growing cover crops in off seasons is a good, cheap way to build your soil’s fertility. I like to do fava beans in the winter. Not only do they add nitrogen, but if you let some fruit you’ll have delicious beans for soups and salads! Plus you can save some for the next year. Yes, legumes are great as a cover crop. I am so jealous for I live overseas and starting a garden is not an option for me. My friend use to give me groceries from her garden when I was in the states and the goods were always so delish. Good luck and I hope we get an update later on. You can always use this time for research so once you’re back in the states you’ll be ready to jump straight in. In the meantime, enjoy the experience of where you are. Oh I love this post! I started my veg garden at the beginning of Summer. Our rainwater tank carked it halfway through so we had some losses due to scorching summer temps and lack of water but some did survive. I have just harvested my first bowl of cherry tomatoes! I’ve found that seed saving and homegrown groups of Facebook often have great tips on where to buy cheap seeds and sometimes can organise swaps via post. I recently got 10 packets of seeds for $10 and free postage, I now have tiny baby onions, cabbage, broccoli and some herbs sprouting. For some reason I forgot to order Cauli- sad because the price at the shops is crazy right now. The price of cauliflower is nuts! I saw them for $6.98 yesterday. I’ll be squeezing as many as I can in the garden this winter. It’s very satisfying picking and eating food from your own garden. Good luck with your vegies!